To view a jump list, simply right-click on an application (program) icon in the taskbar (usually the taskbar is positioned at the bottom of your computer screen as shown in the example). The jump list features the most recent files (of the application) you have been working with. 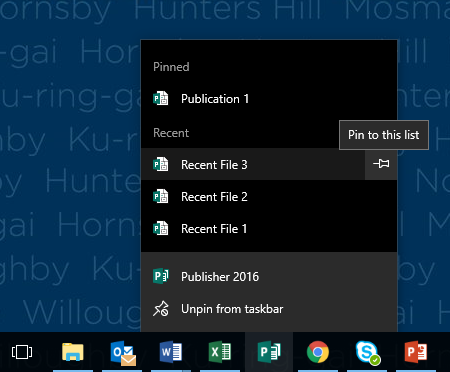 You can drag & drop a file or template onto a taskbar icon to ‘pin it’ to the jump list. 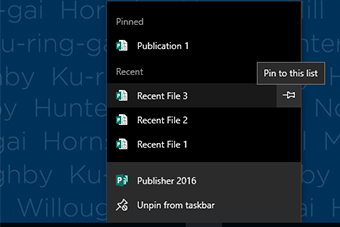 Alternatively, you can left-click the pin icon (‘Pin to this list’) that is displayed to the right of recently-opened files as shown in the example. Jump lists provide an often much faster way to access the files or templates you are regularly working with (potentially saving you a few minutes’ worth of valuable time each day).